The ase.lattice module. The module contains functions for creating most common crystal structures with arbitrary orientation. The user can specify the desired Miller index along the three axes of the simulation, and the smallest periodic structure fulfilling this specification is created. Both bulk crystals and surfaces can be created. The ase.cluster module. Useful for creating nanoparticles and clusters. plus Be2, C7NH5, BDA, biphenyl and C60 (for historical reasons). 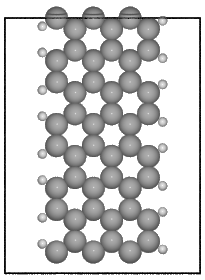 Crystal structure and lattice constant(s) will be guessed if not provided. Chemical symbol or symbols as in ‘MgO’ or ‘NaCl’. Must be one of sc, fcc, bcc, hcp, diamond, zincblende, rocksalt, cesiumchloride, fluorite or wurtzite. c/a ratio used for hcp. Default is ideal ratio: sqrt(8/3). Internal coordinate for Wurtzite structure. Construct orthorhombic unit cell instead of primitive cell which is the default. Construct cubic unit cell if possible. Creates a graphene nanoribbon in the x-z plane, with the nanoribbon running along the z axis. The width of the nanoribbon. For armchair nanoribbons, this n may be half-integer to repeat by half a cell. The length of the nanoribbon. The orientation of the ribbon. Must be either ‘zigzag’ or ‘armchair’. If true, hydrogen atoms are placed along the edge. 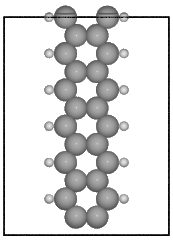 Carbon-hydrogen bond length. Default: 1.09 Angstrom. 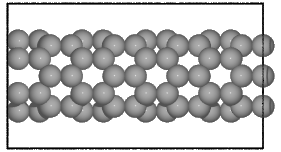 Carbon-carbon bond length. Default: 1.42 Angstrom. Amount of vacuum added to non-periodic directions, if present. Magnitude of magnetic moment if magnetic. ASE contains a number of modules for setting up atomic structures, mainly molecules, bulk crystals and surfaces. Some of these modules have overlapping functionality, but strike a different balance between flexibility and ease-of-use.